Pools for the 2019 IEC program have opened for many countries. This means you’ll be able to create your profile, and begin your IEC journey. Read on for updates and guidelines to help you participate in the 2019 IEC season. Interested in a working holiday in Canada in 2019? Find out about International Experience Canada (IEC) Working Holiday work permits (sometimes referred to as a Working Holiday Visa in Canada) on this page. We created this short video to help you understand how how the working holiday visa in Canada works, and how you can benefit. What is the IEC Working Holiday Visa in Canada program? It provides temporary work permits to young people from over 30 countries, so they can legally live and get a job in Canada. The permits are valid for either 12 or 24 months, depending on your country of citizenship. Candidates must first create a profile, which notifies Canadian authorities of their desire to receive a working holiday visa in Canada. Successful candidates will receive an invitation to formally complete their application for a work permit, however this success is subject to eligibility and availability. Get your free copy of the Moving2Canada’s Getting Started Guide to plan your move. View the full list of International Experience Canada participating countries, including the different categories of work permits that are available. A new requirement for certain IEC applicants to submit biometric data, including electronic fingerprints, at designated centres has already caused confusion and disruption for applicants over the second half of 2018. This confusion and disruption is likely to continue into the 2019 IEC season, and it is crucial for potential applicants to understand the requirement and how to alleviate potential stress caused by it. See our biometrics for IEC guidelines for full details and advice. You can create a profile on the Immigration, Refugees, and Citizenship Canada (IRCC) website. Draws take place at “regular intervals”, where candidates are selected at random to receive an invitation to apply for a work permit, until all places are filled for the year. This means you can create a profile and become a candidate at your leisure, any time after the opening date for your country. However, your best bet is to become a candidate as early as possible for a working holiday visa in Canada, as this IEC category is particularly popular. This will expose you to a greater number of these draws. You’ll be asked to enter one or more ‘pools’ as determined by country and work permit category. ‘Australia: Working Holiday’ and ‘Ireland: Young Professionals’ are examples of pools. IRCC has committed to giving at least five days notice before each country’s and category’s final rounds of invitations, which will mark the closure of that pool for the season. Here’s how to become a candidate, and receive an invitation to apply for an IEC working holiday visa in Canada. Be a citizen (passport holder) of one of the 34 countries that have a “bilateral youth mobility agreement” with Canada. In other words, one of the International Experience Canada participating countries. Have a valid passport for the duration of the stay in Canada (the work permit issued will not be longer than the validity of the passport). Be between the ages of 18 and 30 or 35 (inclusive) at the time of application. The upper age limit depends on the applicant’s country of citizenship, as outlined in our International Experience Canada country list. Have the equivalent of at least CAD$2,500 on landing to help cover initial expenses. Be able to take out health insurance for the full duration of their Working Holiday Visa in Canada (participants may have to present evidence of this insurance at the point of entry in Canada). View providers and get quotes on our travel insurance for Canada page. Have, prior to departure, a round-trip ticket or the financial resources to purchase a departure ticket for the end of their authorized stay in Canada. Not be accompanied by dependants. Pay the appropriate fees, as outlined in the ‘Apply for a work permit’ section below. Citizens of certain countries are also required to be resident in their country of citizenship at the time they apply for their Working Holiday Visa in Canada. See residence requirements here. Sign-up for the latest news, and helpful advice as your arrival date in Canada gets closer. Complete the Come to Canada questionnaire. This is used as an initial assessment of your eligibility for an IEC work permit. If you meet the criteria, you’ll receive a personal reference code. Enter this code to create your account. Submit your profile and choose the IEC pool(s) you want to be in. Some candidates will only be eligible for one pool, while some may be eligible for more. At this stage, it’s a case of waiting to be selected, as you’ll need to receive an invitation to apply (ITA) in order to continue the process. Where numbers in the pool greatly exceed the number of permits available, this will reduce your chances of receiving an ITA. Get the latest update on your chances at our Working Holiday Canada news hub. If you receive an ITA, you will have 10 days start your application for a Working Holiday Visa in Canada, or to decline the invitation. Once you press the ‘Start Application’ button to formally accept the ITA, you’ll have 20 days to submit your work permit application and pay any relevant fees. In the IEC Young Professional and International Co-op categories, your employer also needs to pay the CAD$230 employer compliance fee through the employer portal before the 20 days expire. They’ll need to send you the Offer of Employment number they receive so you can enter this in your application. Gather and upload all the documents (e.g. police or medical certificates) requested by IRCC. If you don’t have these immediately, you can upload proof that you’ve applied for a police cert or medical exam. Pay relevant fees. To get a Working Holiday Visa in Canada, it will be necessary to pay a participation fee of CAD$150, and an open work permit holder fee of CAD$100. IRCC will assess your application and may request additional documents. If your application is a success, a letter of introduction (LOI) will be sent to your account. Bring this with you on your journey to Canada as you’ll need to present this to an immigration officer at a Port of Entry (POE), such as an airport or border crossing. This is where you’re provided with a work permit. The Young Professionals category is designed for foreign youth, particularly post-secondary graduates, who wish to further their careers by gaining professional work experience in Canada. Participants must have a signed employment offer letter or contract of employment with a Canadian employer before applying. Read our full guide to IEC Young Professionals Canada work permits. 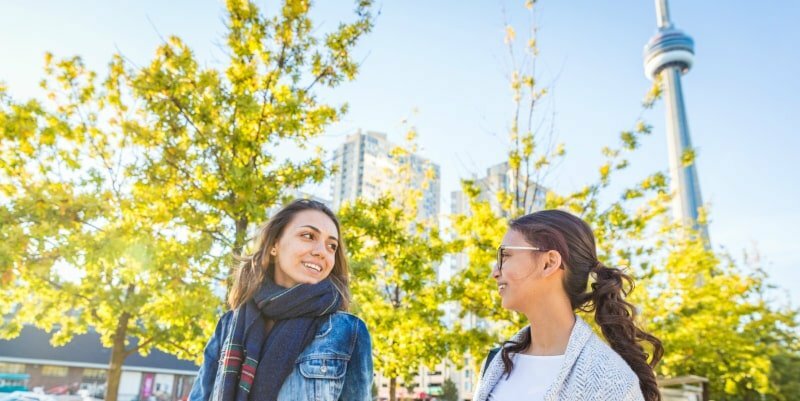 The International Co-op (Internship) category is designed for foreign youth who are enrolled at a post-secondary institution in their country of citizenship. Applicants must want to complete a work placement or internship in Canada to fulfill part of their academic curriculum and be registered students for the duration of the internship. Permits issued under this category are generally valid for up to 12 months, though some participants may be issued a longer validity due to their citizenship. Applicants must have a signed job offer letter or contract for a work placement or internship in Canada that meets the requirements of their academic curriculum in their country of citizenship. The eligibility requirements for the Working Holiday Visa in Canada, listed above, also apply to the International Co-op category. Read our full guide to IEC International Co-op work permits. Please explore our many resources to help you plan your application. Research is crucial as you plan for success in Canada. Where to buy your travel insurance for Canada (note: this is a mandatory IEC requirement). Moving2Canada readers get their first five international money transfers free with CurrencyFair. Get all the information you need in our dedicated IEC section.